SwissGear make some great backpacks, but figuring out which one is best for your situation can be time consuming. That is why in this review I am going to show you which is the best one for specific situations and why. After all, not every pack is meant for everyone, and in every kind of situation. Seems obvious, but it's worth mentioning. 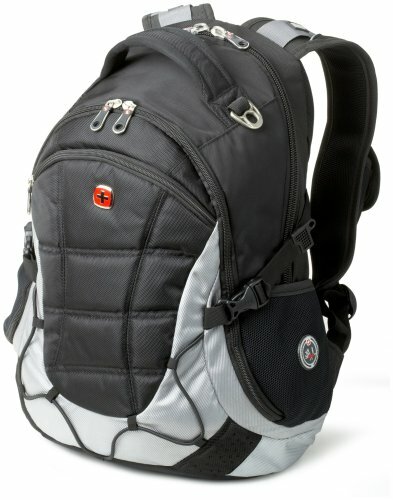 SwissGear has added some great features to this backpack to make it super-useful to travelers. The one that really stands out for me is the "SmartScan lay-flat" system they use to enable you to open up and lay the pack down for TSA X-ray security scanning. You will almost always NEVER need to remove your laptop at security again! One side is for the laptop (up to 17 inch) the smaller side is a "floating" tablet holder. Both are padded. There are quite a few other great features on this pack so I am just going to list them below. You can also see the organizers in the images here, to help you get an idea of how well designed this pack is. This pack has a home for almost everything. 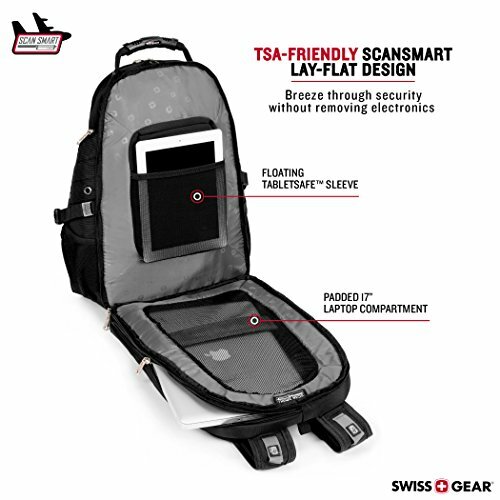 The smart laptop security TSA system combined with the other smart features make this a super-handy pack for frequent travelers who carry up to a 17" laptop or other media devices. It is also made by the makers of the Swiss Army knife, so what more could you want for quality? A very similar model is the SA1908 from Swiss Gear which also features the SmartScan lay flat system to help you speed through security! This is a slightly simpler design to the 1900 model above, but has quite similar and useful features like the SmartScan which is really a godsend for travelers! And, there are enough other pockets and specific features (like the media holder for your phone) that make it a great backpack for most people. If you just want a laptop backpack for day to day use, then this one is going to tick all the boxes. Unlike those above with the more complicated (but handy for travel) SmartScan, this bag keeps the laptop inside the main compartment at the back (where it is protected and balances the load best). 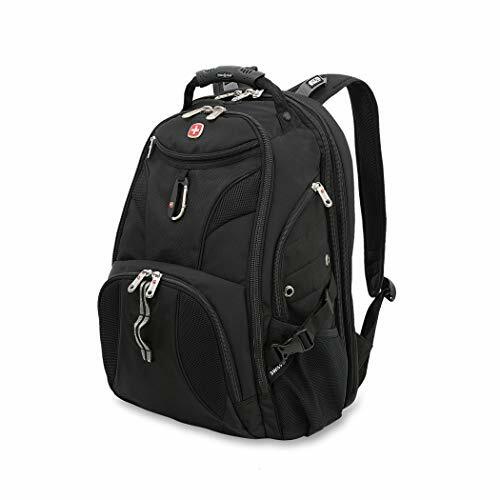 This SwissGear laptop backpack is well designed to keep things separated and in the perfect spot, while still giving you plenty of space to carry your bigger items in the main compartment. What I like about this pack over the SmartScan packs above is that it is simpler and has less pockets or complexity. You know where you stuff is, and there is a spot for everything.